Today is Memorial Day...a day originally known as Decoration Day. It was begun to honor of the Union soldiers who gave their lives in the American Civil War. Eventually it became a day to remember all those who gave their lives in service our country. It has also become a day to remember loved ones who have passed on. but reside in our hearts memory. Memory can be a comfort. And so I give thanks. Gorgeous, gorgeous cup! Thanks for hosting Tea Cup Tuesday! Hi Terri! I love this cup. I love it because it's blue and I love it because it has one of my favorite flowers painted all over it. I have always loved forget-me-nots. I loved your beautiful tribute for this special day Terri! 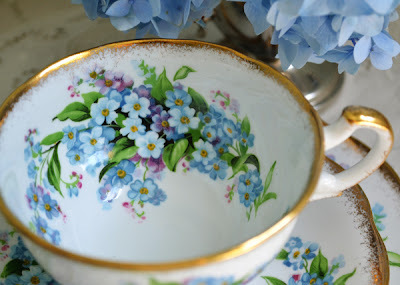 Your forget-me-nots teacup is darling! It's just so pretty and your post is lovely, honouring all those who gave so much and those who have gone before us. I am a Canadian and I didn't realize that it was a day to not only remember soldiers but loved ones who have passed as well. Thank you and have a lovely week. 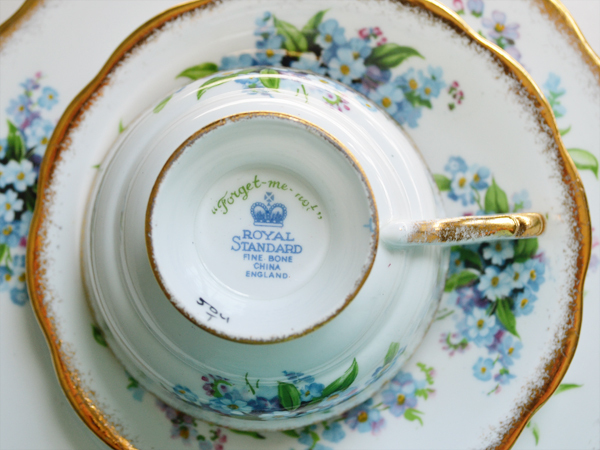 What a wonderful tea cup in Memory of all who have served. I love the forget-me-nots for Memorial day! Thanks for hosting. Have a wonderful week. Hi Terri, Your tea cup is so lovely! I grow pink as well as blue forget-me-nots in the garden. Love your hydrangeas too. I didn't know anything about that American celebration, but now I see you chose the perfect cup for the day...and a beautiful one, indeed! Thanks for hosting this lovely tea. Your forget me not teacup is so very pretty. Thank you for hosting such a lovely tea. Beautiful post, Terri! 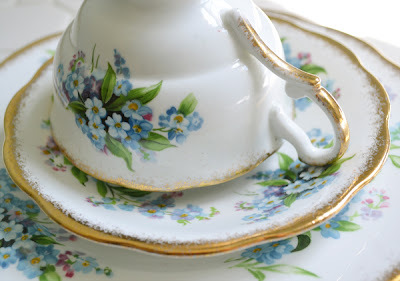 Love the Forget-me-nots teacup. Perfect for the Memorial Day Holiday. Well done and Happy Tea Day! Your forget me nots are indeed perfect! I love teacups with that theme. Happy TT! All beloved persons are never forgotten. I am so sorry for all persons who died in wars. Your sweet tea cup is such a loving sign. Dear Terri,when I linked in I realizes that I have no china today - I hope this doesn't matter?! Thank you for sharing your treasures and for hosting this sweet event. What a beautiful tribute for Memorial Day. Your forget me not tea cup is so pretty, just like the flower. It is so fitting for the holiday and spring. Thank you for hosting this fun tea party! Have a wonderful week. 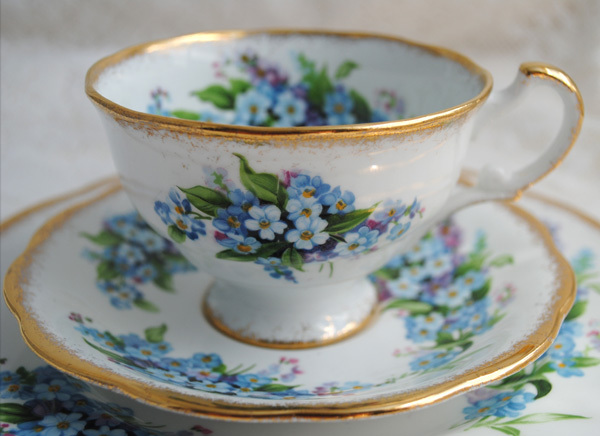 Hi Terri, the loveliest Forget-me-nots cup-so beautiful, and sweet. My flowerbed is cowered in Forget-me-nots just now, a blue sea of little flowerheads. 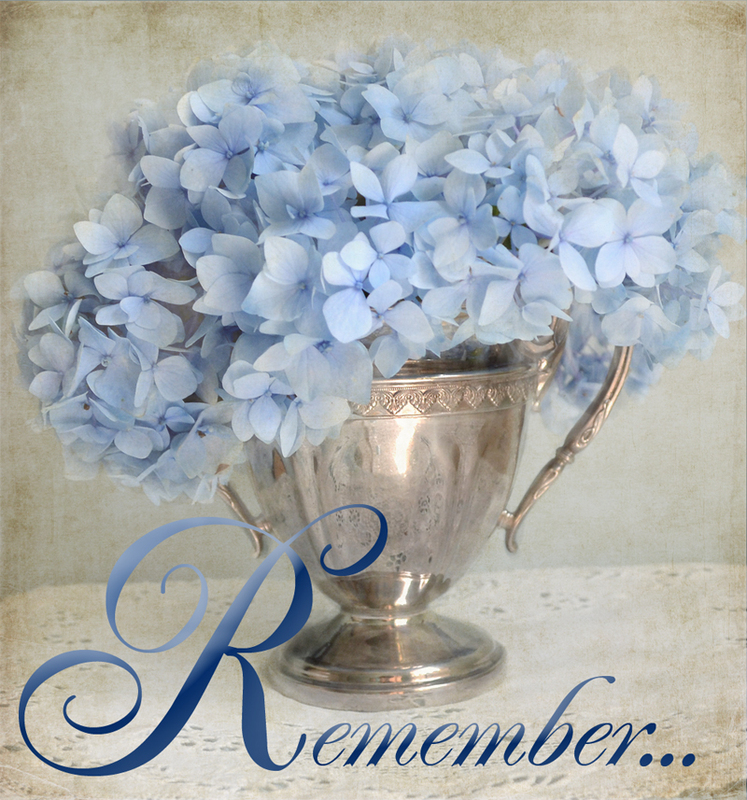 Such a thoughtful post and this forget- me- not cup is more than appropriate for Memorial Day! I have always loved this delicate flower! Thank you, Terri! Wow..what a heartfelt tribute and super beautiful post Terri..LOve the first lush image..woah..and the gorgeous cup with forget me nots is absolutely enchanting...so pretty!! Yay..thankyou for another exquisite post!! Wishing you a most joyful week! I love the cup and saucer. There's something so charming and whimsical about Forget Me Nots. I'm sooo happy you liked the book! Thank you so much. You'll have to tell me how your Granddaughters like it. Thank you Terri! Forget-me-nots are just the sweetest. Beautiful Terri and the sentiment is so thoughtful. Oh, Terri--what a lovely post--beautiful sentiments, beautiful flowers, beautiful teacup and saucer!!! What a really lovely post Terri. That is a beautiful teacup and the hydrangea is just gorgeous-I love that flower especially because it brings back so many happy memories of time spent at my great grandmother's home. She had several bushes of gorgeous blue blooms. Thank you. Love it, beautiful blog and lovely cups. I am in the process of designing my new blog header. May I please use your tea cup photo graph as part of my design? I would like to use the 2nd photo down from the top, in this post. I would of course give photo credit to you. Please do let me know. Thank you!